Almond Milk. Do you drink it or have you tried it? It is delicious. To me, it taste much better than regular milk of an kind. Of course, I’ve never particularly enjoyed the taste of milk, unless it was laced with some kind of sweet sugar like chocolate. In which case, I still could not drink much of it. Almond milk brought a whole new flavor and style to my diet. I suddenly started putting it in coffee, blending it in smoothies, drinking it plain, making ice cream with it, and more. Regular milk no longer did anything for me and I upgraded to buying almond milk. For a while I tasted different kind of boxes found at the grocery store; non refrigerated, refrigerated, different brands, flavors, it was all good and all so easy. Then I heard it was easy to make and I suddenly became curious. Could I, a somewhat lazy shopping consumer possibly take time to make almond milk? I did not think so. I had to be told a dozen times I could do it and it was easy. One day I had some time and thought I’d try it. I had found the perfect nut bag to use to drain and finally ventured to the store for almonds. 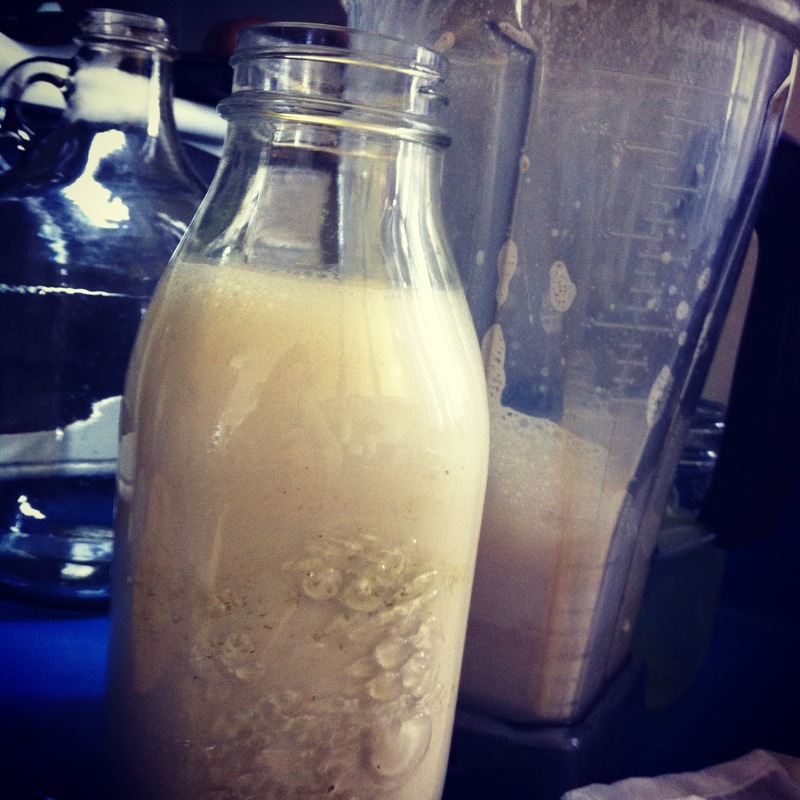 Then I experimented with making my own almond milk. To my surprise, it really was easy. So so easy. best of all, it took little to none ingredients: raw almonds, water, and option to add vanilla, a date, or anything else I want…. 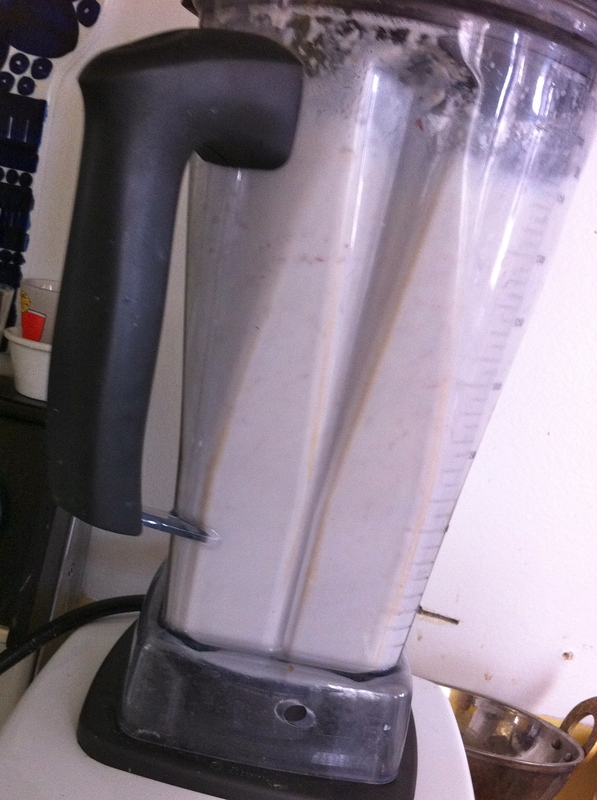 If you have a high speed blender, like a Vitamix, I encourage you to just try to make your own almond milk. You just may be surprised at how easy it is… and if you don’t drink almond milk I dare you to try it, even the boxed version. You will be amazed at how much better it tastes and how much better YOU FEEL (and it’s a whole lot healthier for you than anything supporting the dairy industry). What you need: A high speed powerful blender, like a Vitamix. One nut bag (My friend has used a paint strainer bag too). Raw almonds. Purified water. A large bowl. A container to put milk in after it is made. Optional: vanilla, cinnamon, dates, nutmeg, etc. Step 1: Soak your almonds overnight (or at least 6 hours) in a sealed container with fresh water. I recommend about 1.5 cups raw almonds per blender of water, or so. Step 3: Fill blender with purified water. I typically fill almost to the top, but experiment with your own proportions. Step 4: Add raw almonds to blender. Blend well! It may get a little foamy, that is okay. 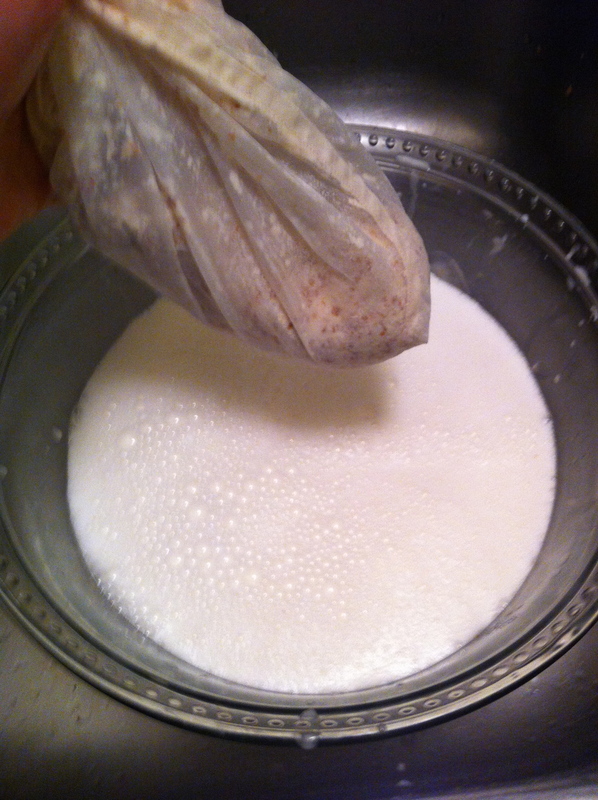 Step 5: Get a bowl and nut milk bag and strain almond mixture from blender through bag into bowl. 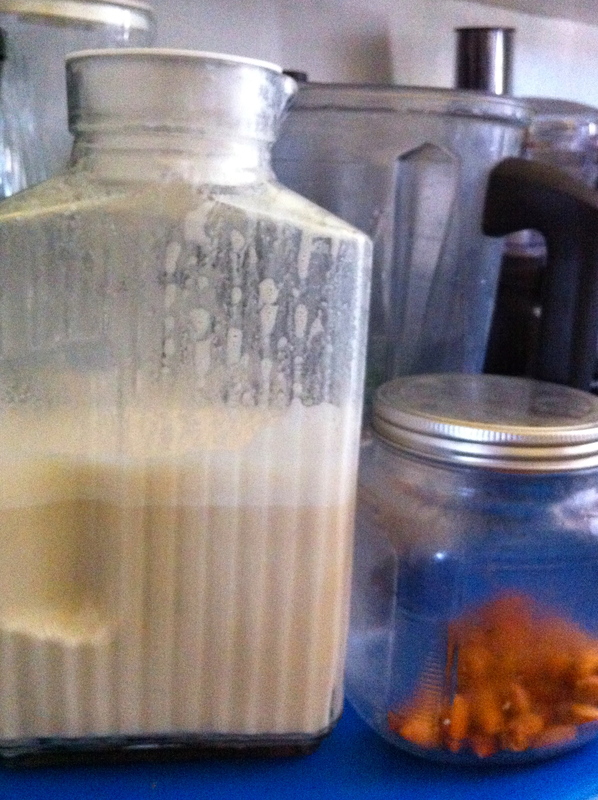 Step 7: Pour almond milk into container and use as it. Or, and recommended, place almond milk back in blender. Step 8: Add anything you want to milk. I personally love to put vanilla flavoring in, at least 1-2 dates, some cinnamon, and nutmeg. It’s your creation so blend, add, subtract, and try new things! Place it in the fridge also and enjoy whenever you want. Typically the homemade milk lasts about 3-4 days. It’s so tasty though, I’m sure you will drink it faster than that!